PALM SPRINGS, CA – The Greater Coachella Valley Chamber of Commerce (GCVCC), in partnership with the Greater Palm Springs Convention and Visitors Bureau, has announced the launch of “Fly PSP First,” a regional public service campaign designed to highlight the economic impact of the Palm Springs International Airport (PSP). This “Fly Local” campaign will encourage both local business and residents to utilize PSP whenever possible for air travel. Palm Springs International Airport (PSP) is an essential economic driver for the Coachella Valley, as it serves a region of more than one million people. Currently, 10 airlines fly non-stop from Palm Springs to 18 destinations, connecting to more than 500 destinations around the world. Since 2009, PSP origination and destination passengers have increased by 33%. Increased year-round air access can support efforts to increase both the visitor and corporate base of the Greater Palm Springs economy. The Greater Coachella Valley Chamber of Commerce believes that it’s time for all regional businesses to rally around a “Fly PSP First” pledge. If business owners and residents alike pledge to fly PSP whenever possible, it is more likely Palm Springs’ existing airlines will respond by adding new flights to existing routes and/or expanding routes to new destinations. In addition, airlines that currently don’t serve Greater Palm Springs would begin to look at PSP as a destination with the opportunity for successful growth. PSP is doing its part, investing tens of millions over the next several years to enhance capacity and improve the traveler experience at what is already one of the most accessible and easy to access airports in the world. It was recently named one of “America’s Most Stress-Free Airports” by Smarter Travel. The Fly PSP First campaign launches Monday, May 7th. A public awareness campaign will run through the summer travel period, with on-going support for the program to continue indefinitely. For more information on the Fly PSP First campaign, or to take the pledge to support PSA, visit FlyPSPFirst.com. The Chamber is a business membership organization representing the Coachella Valley. We support our members through legislative advocacy, education, networking, and other community based opportunities. The Greater Coachella Valley Chamber of Commerce is a registered 501c6 non-profit supported through member contributions. The Greater Palm Springs Convention and Visitors Bureau (CVB) is the official tourism agency for the entire Coachella Valley, providing sales, marketing and promotional efforts targeted to potential leisure and convention group markets. 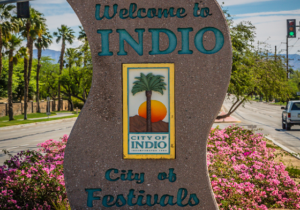 The CVB serves more than 2,000 business partners throughout Riverside County’s nine-city region of Palm Springs, Desert Hot Springs, Cathedral City, Rancho Mirage, Palm Desert, Indian Wells, La Quinta, Indio and Coachella.